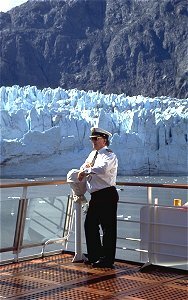 Alaskan cruises and Alaska Ports-of-call profiles. In the dusky 10:30 p.m. Alaskan light the towering mountains are inky black as clouds boil past, wrapping around the outcroppings with a misty embrace. Passengers on the 16-story CROWN PRINCESS wined and dined, have gathered on deck to gaze at pockets of snow, small glaciers and a vast land of wilderness splendor stretching for hundreds of miles in all directions. Images emerge of bald eagles, caribou, moose and hungry bears, as distant foghorns sound. The ship slips southward to the Alaska 1,000-mile long Inside Passage, and a glorious landscape that includes views of Glacier Bay and visits to Skagway, Juneau, Ketchikan, Sitka and Anchorage. The vessel seems to gather us in like a mountain cabin in a snow storm as we enjoy classic British afternoon tea followed by a video in our cabin about early Alaskan history, the hard working pioneers and the short summers that bow to the claws of winter by mid-September. Cruisers quickly discover a glorious and intimidating land. An Officer said, "In Alaska you have to go around everything instead of through it. The majestic land offers endless possibilities for those who love nature." It is difficult to imagine how the first ships made their way. The deep blue sky is often laced with misty clouds that are constantly changing in shape and size, creating weather patterns that vary from minute to minute. Hundreds of small islands have to be navigated while land on either side of the ship is so near at hand that it seems you could reach out and swat a pesky fly on a bears nose. 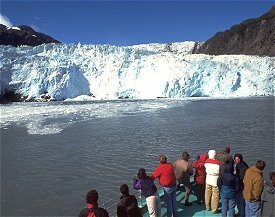 Alaska is twice the size of Texas, and, including islands, has 47,300 miles of shoreline; 4 million acres of National Parks, preserves and monuments; 17 of the nation's 20 highest peaks; more active glaciers and icefields than in the rest of the inhabited world; 15,000 bald eagles; a ton of gold and ice- free ports. Sailing the Inside Passage, you are in touch with the energy of a massive landscape. The weather is irrelevant. Rain feels natural in Alaska. Alaskans play Little League baseball in the rain, take leisurely without umbrellas and generally accept it as part of the territory. A sign in a Juneau book store reads: "Please don't drip on the books." Alaskan ladies quip, "When a 50-mph wind is blowing, it's just another bad hair day for us." The four month-long Alaskan cruising or summer season is intense, and the time to explore a rugged landscape ranked by many cruise ship captains as among the most attractive in the world. 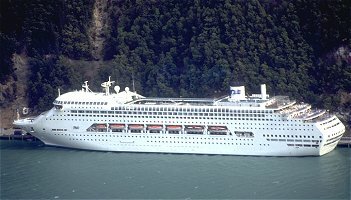 In 1989 travelers could chose from 243 sailings. 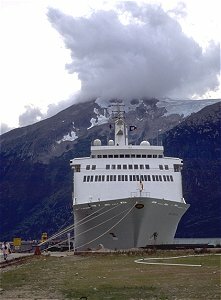 In 1999 make your selection from a whopping 370 Alaskan cruises with shore excursions ranked among the best anywhere. 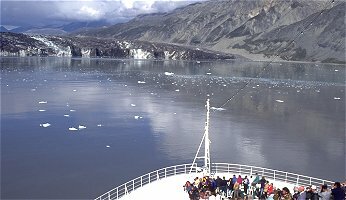 New in the 2000 Alaska season for Royal Caribbean International's RHAPSODY OF THE SEAS and VISION OF THE SEAS, are sailing to the remote and active Hubbard Glacier. Among the largest glaciers in the world, the region is teaming with wildlife including grizzly bears and seals that like to hook rides on chunks of ice and then take a snooze after passenger watching. Princess, the leader in Alaska cruisetour travel, can satisfy almost any Alaska travel whim with their extensive land excursion offerings. River rafting, flights to remote mountain destinations, hikes into the wilderness and dancing under the Midnight Sun, are waiting. The company has four wilderness lodges and hotels, eight custom Midnight Sun Express rail cars and 59 cruisetour options (37 family friendly) that can be combined with 104 Alaska cruise departures in 1999. 1. 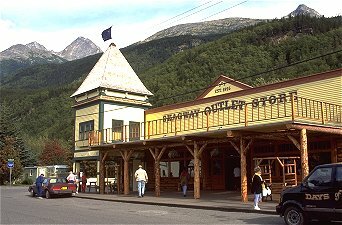 SKAGWAY - The preserved gold mining town of Skagway with its forest-covered fjords unfolds like an old museum painting of early Alaska. The ship's comedian joked about the block-long town and a library that has only one book, the yellow pages. Cars are never stolen here, only missing for a few hours, and if you have a toothache, sign up with the dentist who drops in once a month with his trusty drill and a big smile. Alas, they paved Main Street in 1984, which upset the moose who like to drop in and chew on yard plants. Stores signs read, "Please Leave Backpacks Outside." They sell hikers bells to scare away bears which locals have tabbed "Dinner Bells." The bells and bears don't faze the moose. The dress of the day for many folks is a wool shirt, rubber boots and good old blue jeans. Residents say, "We don't have a town character, we all take turns. And during the winter when there are only four hours of light, our stories slowly evolve to shady tales." The histoic Red Onion Saloon, formerly a bordello with pictures of slinky ladies of the night decorating the walls, is where the ship's musicians sit in for a set or two and jam on some straight ahead jazz. Crystal's Glacier Point Wilderness Safari combines scenic flights with an all-terrain trek through the rain forest, a glacier walk and canoe ride among icebergs. It's a short flight to the old gold mining town of Haines and a float through a maze of channels on the Chilkat River and a visit to bald eagle country. Art Sbarsky, Norwegian Cruise Line's Executive Vice President said, "We have created fun and educational `adventures' for our `Kid's Crew,' and exciting shore excursions such as the White Pass Train and Bicycle tour, or an hour-long excursion on a vintage motorcar with a madcap tour of the city's historic district and a visit to the "largest gold nugget in the world." 2. JUNEAU - In contrast to Skagway, Juneau is filled with art galleries, hanging pots of flowers, cozy restaurants and hotels. Pioneering miners came in search of gold and stayed to build a town. 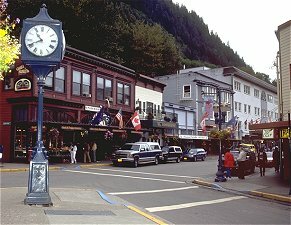 Named after Joe Juneau, a prospector who discovered gold in a creek behind the city in 1880, Juneau built on hills, not unlike San Francisco, might be the United States' most attractive state capital. Inaccessible by car, Juneau is a wonderful mix of hiking boots and high heels, draft beer and fine wine, last frontier and cosmopolitan life. You will find it all in the historic old Red Dog Saloon complete with a sawdust floor, player piano and a stuffed 300 pound halibut hanging from the ceiling. The city is wedged between Mt. Juneau and the mainland of Gastineau channel, sheltered from the Pacific Ocean by a 75-mile wide belt of islands. The Alaska State Museum, in the heart of town, will further an appreciation of the Last Frontier. Shore excursions land passengers on the nearby Mendenhall glacier, via a helicopter, or to a remote glacier-fed river rafting adventure where bald eagles and bears feast on spawning salmon and feisty trout. Passengers experience the essence of the frontier spirit when they spot, miles from civilization, a lone cabin with smoke curling from its chimney and a barking husky dog wagging it's tail at a pontoon plane that zooms low over the horizon. 3. KETCHIKAN - Ketchikan, Alaska's southern most city near the southern tip of the southeast Alaska Panhandle, drenched in 13 feet of rain a year, is where residents say, "If you stand in one place too long you could begin to rust." Billed as the salmon capital of the world, Ketchikan is on Revillaigedo Island, about 600 miles northeast of Seattle. A great port to walk, passengers visit the Tongass Historical Museum and grasp the Tlingit, Haida and Tsimshian peoples connection to the land and the sea. In Saxman Native Village and the Totem Heritage Center, you can chat with master totem pole carvers and photograph the largest collection of 19th century totem poles in the world. While in port there is time for a flight to Misty Fjords National Monument, an area the size of Connecticut, featuring raw wilderness, remote lakes and 4,000-foot high granite formations. NCl entices kids to take an Alaskan Bushplane Ride with stunning aerial views of Ketchikan while Carnival has them on a Mountain Lake Canoe Adventure burning calories. 4. SITKA - St. Michael's Cathedral and it's Russian Orthodox architecture will remind history buffs that Sitka was once the capital of Russia's American empire and Alaska's oldest settlement, founded in 1804. Located on the West Coast of Baranof Island, the city is on an island-studded and mountain-locked harbor with a stunning backdrop of snow-capped mountain cones and deep green forest. Passengers can browse through town stopping at parks, forts and museums and never think about getting lost. Castle hill is a splendid photo opportunity, as are the totem poles and architecture. With the family in mind, Carnival has teens participating in the Sea Otter and Wildlife Quest, and a Bald Eagle Raptor Center tour where they learn about the rehabilitation and release of injured eagles and other raptors. Once the capital of Alaska, Sitka is often a favorite Alaskan port of call by virtue of its extensive history and because it is bypassed by many cruise lines. 5. GLACIER BAY - Sailing into Glacier Bay National Monument is a scene right out of Jules Verne. One can observe the aging process of land ranging from areas only recently uncovered by glaciers and where there are no animals or shelter, to that which is heavily forested. Captain has to be on watch for the Great Humpback Whale and cannot approach within less than half a mile. The ship must avoid seals, the whistle cannot be blown and not even a match- stick can be thrown into the water. Ships are never at anchor. U.S. Rangers are on board to make sure the rules are followed. Only 200 years ago a cruise into Glacier Bay was impossible. There was no bay or maps. Bring along a pair of binoculars for easy viewing. The glacier, a river of ice, is always moving. The water is a light turquoise, dotted with small icebergs that often serve as a resting-place for seals, bald eagles, seagulls and other birds. According to scientists, the snow that fell in the mountains, now compressed into ice on the face of Glacier Bay, fell during the time of Christ. 6. ANCHORAGE - The largest city in Alaska, Anchorage, population 258,000, half of the state's population, has a big heart and as much character as the crusty old prospectors that slip into town for a shave and haircut. Located at the head of Cook Inlet, the city was founded in 1915, opened its port to the world in 1961 and received its first live television transmission in 1974. Not unlike Sitka, moose chomp on yard greenery, and in the winter are so crass they stand on the roofs of the homes surveying the restaurants. The main downtown shopping area is along 4th and 5th streets and is decorated with baskets of blooming flowers during the summer. The 5-star Anchorage Museum of History and Art has a gold prospectors cabin on display and illustrates the survival lifestyle and customs of the Tlinget and Haida Indians. From pretty Resolution Park Captain James Cook set out on his third voyage aboard his flagship RESOLUTION to find a Northwest Passage from the Pacific to the Atlantic. The park is ideal to view the sunset and fall foliage that begins in mid to late August. The tide here, the third largest in the world, averaging 28 feet, is truly awesome and reflects 20,320-foot Mt. McKinley, or Denali as it is know in Alaska, 120 miles to the north. In town, in place of large car lots, the city has the expansive Lake Hood Air Harbor, the world's largest and busiest seaplane harbor. Day excursions from Anchorage include a spectacular 50 mile drive along the Turnagain Arm Designated Scenic Byway south to Girdwood, a rustic community and the Alyeska Resort in the heart of Glacier Valley. Hop on the resort's aerial tram and ride to the 2,300-foot level on Mt. Alyeska and enjoy dinner in the Seven Glacier Restaurant or a libation in the lounge. The views from this vantagepoint are a travelers highlight.